Peters Hamlin LLC is a litigation boutique, focusing its practice in employment law, severance negotiations, Dodd Frank and Sarbanes-Oxley lawsuits, fraud and white collar criminal litigation, executive compensation, unfair competition, trade secret disputes and complex civil litigation. Peters Hamlin LLC distinguishes itself from other law firms through its unique approach to solving legal problems. At Peters Hamlin LLC, the practice of law is strategic, cost-effective and individually tailored to every client's needs. In addition, every client works directly with a Connecticut employment lawyer that has been repeatedly selected for inclusion in Super Lawyers, as well as one that has worked for some of the most prestigious law firms in the country. Among her accomplishments, Kristan Peters-Hamlin has served as Assistant U.S. Attorney in Washington, D.C. and litigated on behalf of Fortune 500 clients in 30 states in both federal and state courts. Kristan Peters-Hamlin brings proven experience in the practice of law to clients in a variety of legal areas ranging from discrimination to complex securities litigation. Attorney Kristan Peters-Hamlin has over 29 years of experience and has tried dozens of cases to verdict. Connecticut employment attorney Kristan Peters-Hamlin represents clients throughout the state and nationwide. Contact Peters Hamlin LLC online or call 203-504-2050 to schedule an appointment. 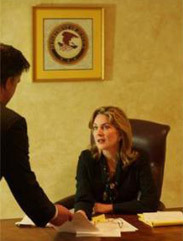 At Peters Hamlin LLC, the goal is to solve your legal problem whether inside or outside the courtroom.